Even when I was younger and couldn't eat spicy food at all I looked forward to going to the Padang restaurant, Rumah Makan Sederhana. Why? 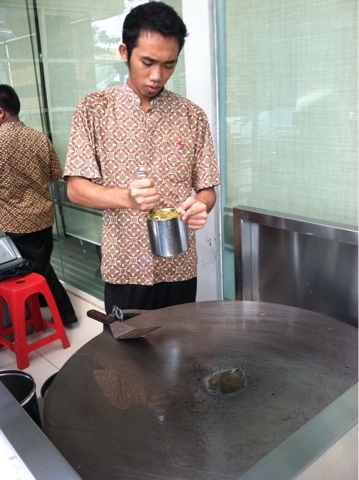 Because in front of it, they sell Martabak Mesir, a.k.a. Egyptian Omelet! This martabak mesir is a typical dish of the Minang people in West Sumatra. Martabak itself is an Arabic word meaning "folded" and is a typical dish of Saudi Arabia, Brunei, and of course Indonesia and Malaysia. How this particular version came to have the name Mesir or Egyptian, I have no idea either. Despite being attached to the restaurant, you still have to order your omelet at the little stand at the front. 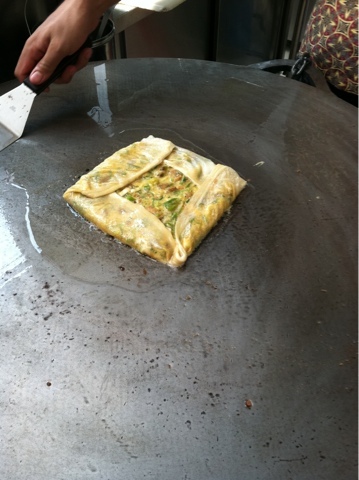 The guy would spin and spin the skin until it stretched thin and big enough for the "omelet"
Then, he mixes minced meat, scallions and onions with egg and curry paste. It's only slightly spicy! Afterwards, put the mixture on the skin, fold, and grill it atop a stone slab. It is served with a sauce made with soy sauce, vinegar, diced chili and pickled cucumber (acar). 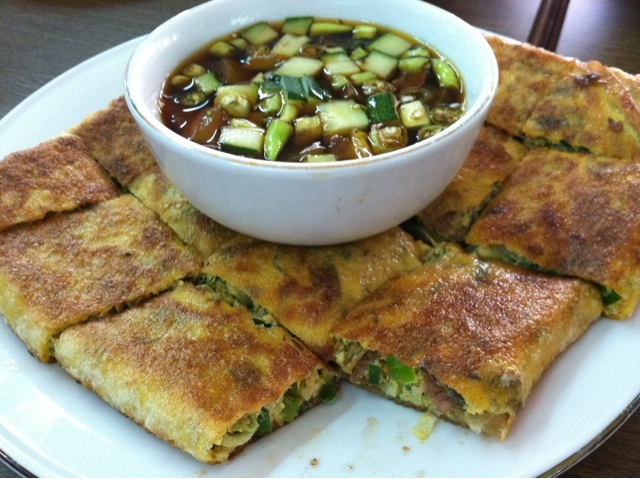 The sauce is in itself a big difference compared to the more common martabak found in Indonesia, but the omelet is also thinner and has a distinct taste thanks to the curry seasoning. I might as well admit, I like this type better! If mom wasn't putting me on a diet, I'd eat the whole plate by myself. Hope I get to go back soon!